Some people say that there are times when music can mirror life as it whips and wisps its course. If that is true I can only hope to have a moment as ridiculously funky as the one Isaac Hayes appears to have for 12 minutes of his life. 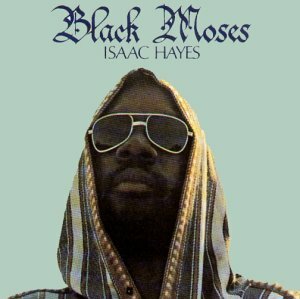 Now when Isaac Hayes is cheffin up anything on the mic you know the soul is gonna be spread thicker than syrup on Aunt Jemima's very own pancakes, but this is potent stuff man. This is soul music on the jam tip something serious. The band takes the incredible energy of a passing glance and magnifies it into an epic orchestral portrayal of emotion as a fleeting moment plays out. The beginning of the track is a flood of strings as violins and guitar tango the track up slowly. A beautiful and slow duel between the two drips with the sadness of a someone who has lost the person they loved. A blues guitar comes in piercing but distorted like time against the smoothness of the violins and vocals, backed by a light beat, an easy base line, and a few weird space noises for good measure. But as the emotion builds, everybody wants in on the jam: the flute player moseys in and out, the horn section starts feelin the flow, and by the time the organ hits, its a wave of soul. The groove rolls on like heady swells, up and down, rocking on a heavy sea. Building and subsiding, jumping back and forth between the past and the future right over the top of the present. While the song portrays a hurt that only love can make you know, the jam brings forth a rejuvenation of spirit in a culmination of funky jammin. The closing half of the track is a celebration of what was beautiful in the past as a man walks towards his future; all in one tumultuous musical journey. This epic cut is actually a transformation of the Dionne Warwick (amazing lady) hit from 1964, and appears on Hayes' 1969 album Hot Buttered Soul...yeah its that funky. if anyone questions this song's all time status, it was sampled by Tupac (Me Against The World) and Biggie (Warning). Done.